Employers are responsible for putting measures in place that will keep their workers safe. However, workplace injuries are still a very common occurrence. In 2012, approximately 4,383 fatal workplace injuries occurred. Construction workers, garbage collectors, nursing aides, paramedics, police officers, and bus drivers are the workers who are most likely to experience an on-the-job injury. If you or a loved one has been injured in the workplace, call Zinda Law Group at (800) 863-5312 for your 100% free case evaluation with our San Antonio workplace accident attorneys. Overexertion can be defined as exerting oneself too much. Lifting, pushing, carrying, throwing and pulling objects are examples of some of the activities that can lead to an overexertion injury. This is not only the most common type of workplace injury, but it is also the most expensive. In fact, according to a report done by the Liberty Mutual Safety Index, overexertion injuries cost companies $3.4 million per year. Fortunately, there are a number of things that can be done to prevent an overexertion injury. Workers should make sure that they stretch before they lift something heavy or engage in any other type of strenuous activity. People should also avoid twisting or bending their bodies when they are lifting something heavy. Furthermore, it is a good idea to ask for help when lifting an object that is very heavy. There are two ways that a slip and fall injury can occur. A person can trip on a floor that is wet. He or she can also trip over an object on the floor. A slip and fall injury is one of the easiest types of injuries to prevent. Spills should be cleaned up promptly. Workers should also place a wet floor sign up after they finish mopping. Additionally, walkways should be kept clear of objects. This type of injury occurs when a person falls from a ladder, stairway, or roof. It can also be caused by faulty equipment. Employee training, diligence, and the use of protective equipment can prevent these types of injuries from occurring. Additionally, employees should make sure that all equipment is working properly before using it. 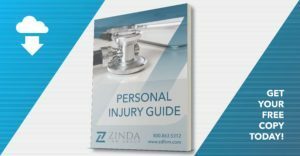 If you have suffered a workplace injury in San Antonio, Texas, then you should contact Zinda Law Group law firm. You may be entitled to compensation if your workplace injury was caused by the negligence of someone else. Our Personal Injury attorneys will work hard to help you get compensated. Call (800) 863-5312 to schedule your free consultation with our workplace injury lawyers in San Antonio.